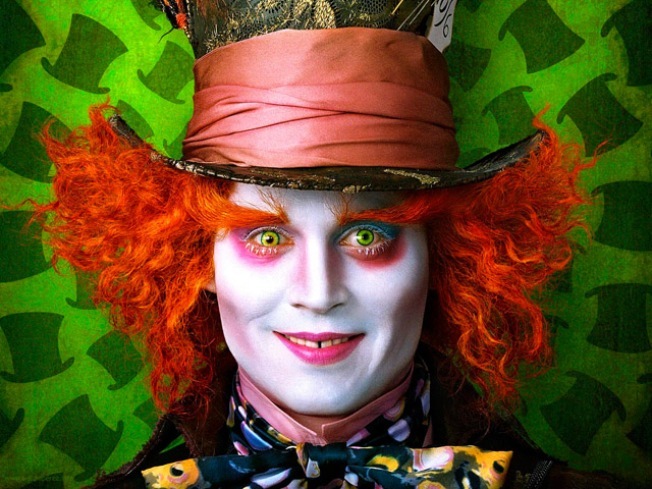 Johnny Depp in "Alice in Wonderland." Johnny Depp, Helena Bonham Carter and other stars of Tim Burton's fantasy 3D film "Alice in Wonderland" braved pouring rain to attend the movie's London premiere Thursday. The stars were joined by director Burton, Anne Hathaway and hundreds of screaming fans who turned up for the event in central London's Leicester Square despite a steady downpour. The premiere came after British movie theater chain Odeon said it had resolved a dispute with Walt Disney Pictures about the release date for the DVD version. Odeon had said it wouldn't show the film in its cinemas in Britain, Ireland and Italy because it objected to Disney's decision to release the DVD earlier than usual, but the chain said Thursday the dispute was over. Odeon didn't disclose details, and there was no immediate comment from Disney. Burton told a press conference earlier Thursday he was relieved the issue was resolved. "I'm just glad it's resolved. We made it 3D to be shown in the 3D screens and so I'm just very happy and grateful," he said. The movie — inspired by Lewis Carroll's classic children's tale — tells the story of the heroine's return to the world down the rabbit-hole at the age of 19. Depp plays the Mad Hatter, Hathaway is the White Queen, Bonham Carter is a bulbous-headed Red Queen and Australian newcomer Mia Wasikowska plays Alice. Burton said the movie's 3D effects enhance the fantastic, surreal world it describes. "3D and Alice seem to fit," Burton told Sky News. "There's something about the trippiness of the Alice world that helps bring you into that 3D space."